On this day in 2007, Gary O'Neil revealed his season of secret agony. Speaking to The News, the midfielder spoke of mornings struggling to walk and the pain of kicking a football. 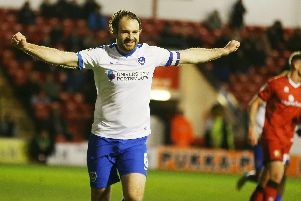 But O’Neil revealed he had put off ankle surgery for months to help Pompey have their most successful Premiership campaign. A bone growth had been jabbing into soft tissue near O’Neil’s heel for more than a year. But the then 23-year-old has missed just three games all season. The former England under-21 skipper had even played on without painkillers after they gave him stomach pains. O’Neil vowed to battle through the last eight games of the season before putting his right ankle under the knife in May. O’Neil said: ‘Adrenaline is the only thing getting me through games. 'My ankle hurts all week in training and even in the warm-ups. ‘It hurts on a Sunday and by Monday I can hardly walk. ‘In training it absolutely kills me. It hurts every time I kick a ball, especially when I hit it with the laces of my boot. I can feel the bone digging into the soft tissue around my heel. ‘When the other lads do shooting practice, I either sit out or shoot with my left foot. ‘By Thursday or Friday it starts to feel a bit better – but midweek games are a problem. ‘I took painkillers for a year, but they wrecked my stomach. I got lots of stomach pains and had to come off them. ‘People have asked why I’ve kept playing and not had an operation sooner. But it’s been a big year for the club and I haven’t wanted to miss any games. Despite the pain through the week it hasn’t affected my performances.